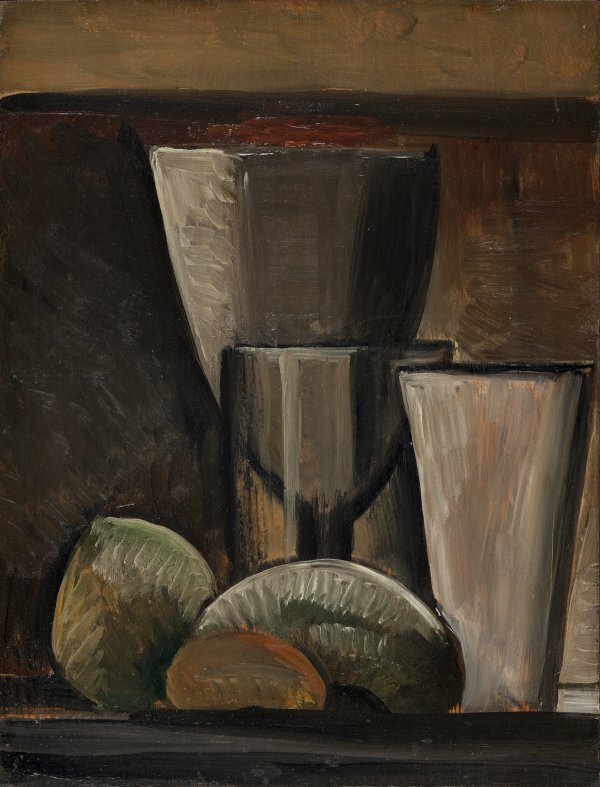 Glasses and Fruit belongs to an experimental series of ten still lifes that Picasso painted in tempera or oil on small, identically sized panels in the autumn of 1908. Christopher Green believes they should be related to the claustrophobic space of the sous bois landscapes executed in the small village of La Rues-des-Bois near Creil, where he spent the summer with Fernande Olivier. Pierre Daix, however, considers them more Cézannian and more proto-Cubist than those produced in the village in the Île-de-France region and reckons they were painted when he was back in Paris as a result of his reencounter with Braque on returning from L’Estaque. The work was sold to the Americans Leo and Gertrude Stein through the Paris gallery of the German dealer Daniel-Henry Kahnweiler and, after remaining in the care of Alice B. Toklas for two decades, passed into the collection of the magnate Nelson A. Rockefeller, before being acquired by Baron Thyssen-Bornemisza.